Chrissy McKaigue says Slaughtneil's qualification for Sunday's Ulster Club Football Final against Omagh has been a "real community effort". "Everybody in Slaughtneil from the age of eight to 80 wants to be involved in GAA," said McKaigue who is now back home after playing in Ireland's International Rules Test in Australia. "There are no other sports. There is nothing else that matters. "It's GAA, GAA, GAA. And when you have that ethos, success will follow." Sunday's game will be McKaigue's second Ulster Club Final appearance after he lined out for Slaughtneil hurlers in last year's narrow provincial hurling final defeat by Loughgiel. However, this weekend's game at the Athletic Grounds will be McKaigue and indeed the Slaughtneil club's first ever appearance in an Ulster Club Football Final. For his part, McKaigue is putting the historical contest to one side as he approaches Sunday's decider. "I just don't think sentiment and sport go hand in hand too often. We just want to try and win an Ulster title. "It's a tremendous club. It's been coming. The club has always been reasonably successful but in the last few years, there has been an influx of underage stars coming through." 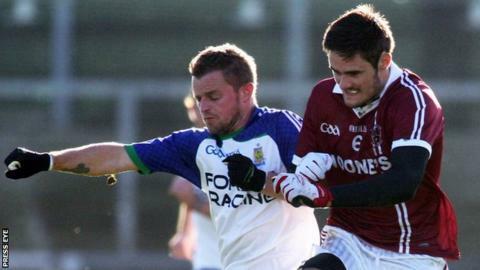 After ending Ballinderry's hopes of four successive county titles by snatching victory in last month's Derry Final, Slaughtneil have progressed to the provincial decider thanks to hard-earned wins over Cavan Gaels and Clontibret. The Derry champions are hopeful that full-back Brendan Rogers will be able to make his Ulster SFC debut in Sunday's decider. The 20-year-old missed his side's wins over Cavan Gaels and Clontibret because of a hamstring injury sustained in a county Under-21 semi-final at the start of November. Meanwhile Shane Kelly provides an added option as midfield cover, having recovered from a calf injury.